Marriages are not always about joyful times. It’s also about caring for your near and dear ones during their difficult days of life. 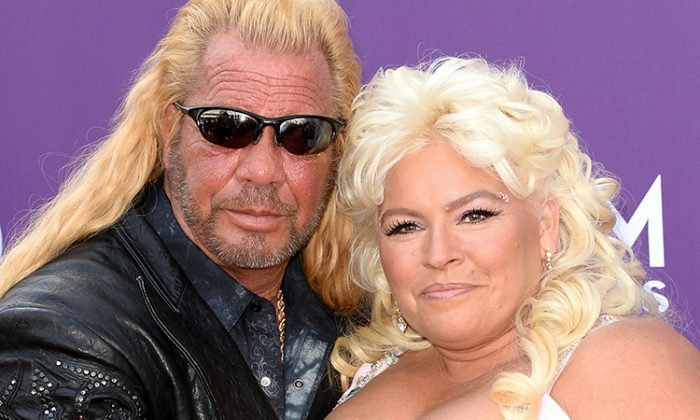 “Dog the Bounty Hunter” is keeping up with his wedding vow “until death do us part” by being there for his wife, Beth Chapman, as she battles a life-threatening disease. The reality star Beth Chapman was diagnosed with stage 2 throat cancer back in September 2017. She underwent surgery to remove the tumor from her throat and was declared cancer-free. “And that truth has really, really come alive in my mind. And I have to stand on that; I gave her an oath that I would love her forever. And thank God it’s not till death do us part at this point,” he added. Sure enough, Dog, who tied the knot with Beth in 2006, has been taking his marriage vow seriously ever since his wife’s throat cancer returned in November 2018. With Valentine’s Day just around the corner, Beth proudly showed the world her love for Dog and vice versa in a romantic photo she posted on Instagram. In the recent photo, Dog is seen standing beside Beth on a porch surrounded by green trees as he places his cheek against hers in a loving embrace. “Sooooo in love with this guy,” Beth captioned the image. The photo of the lovey-dovey couple has since received more than 72,000 likes, with many raving over their deep affection for each other. “Your [sic] soul mates, both are lovely couple,” one user said. “True love is so hard to find nowadays. Hold onto those precious moments Beth and dog,” another remarked. “I will fight every step of the way. My husband and children are counting on me to be there for years to come. I am so very grateful to be surrounded by family and friends who have given me incredible support during this very challenging time,” Beth wrote in a heartfelt letter addressed to her fans. A cancer diagnosis is surely devastating, and undeniably, family support plays a vital role in cancer survivorship. It certainly helps patients a great deal when loved ones put their arms around them to offer much-needed comfort. So, beyond doubt, with the immense love and support from her husband and kids, Beth, who is currently undergoing chemotherapy treatments, will persevere in her fight with cancer, though given a 50/50 chance of the treatment working, according to E! News. Reportedly the couple will be back on the TV for their new show, Dog’s Most Wanted. We wish Beth a speedy recovery. May the angels of good health raise her from the suffering so that she can experience the joy of being healthy again.